Interior Features Traditional home with wonderful outdoor entertaining area on a huge lot with a sparkling pool shrouded in lush foliage in the heart of Sherman Oaks? Hardwood floors in living room with fireplace and plantation shutters. Beautifully remodeled kitchen with rich wood cabinets, top of the line appliances, rolling pantry and much more overlooks dining area. Master bedroom with remodeled bath en-suite and enormous walk-in closet opens to wonderful covered patio that serves as an outdoor living space. Garage has been converted to an office/guest quarters with ¾ bath. Creative landscaping with pavers and synthetic grass make the drive usable space for kids to play or for entertaining. Enormous deck beneath shade trees perfect for relaxing on sunny afternoons floating in the pool or staring at the stars at night. 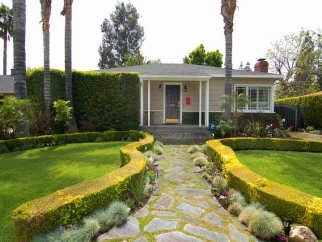 Extra deep lot shaded by towering trees has mature landscaping that provides total privacy. Dare to share this romantic hideaway with someone you love.